I f you didn’t make it to this week’s Rotary Club of Forest Grove meeting, below is an overview of what you missed. 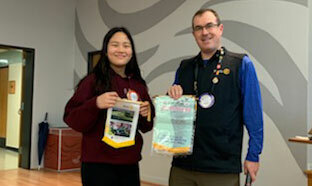 Banner Trade: At last week’s meeting, our inbound exchange student, Sara Bang, presented our club with a banner from her club in South Korea. It is a longstanding tradition for our exchange students to bring a banner from their club abroad and go home with one from ours. Sara is almost complete with her experience and the process is well underway to bring our next inbound student here! Rotarians At Work Day: For this year’s Rotarians at Work Day project, we are staying focused on a longtime club project – the MacDougall Garden at the east end of Forest Grove (along Pacific Ave. and 19th Ave. adjacent to the big flagpole). We will not only work on any remaining ground prep, but will also plant the flowers that will beautify that space this summer. The project will take place on Sat., Apr. 27, 8:30 a.m., at the Garden. A sign-up sheet will go around at the next two Wednesday meetings or you can sign up by contact Geoff Faris. Silent Auction At The Crab Feed: We were able to raise $1,160 that will directly benefit The Rotary Foundation. Thank you to all who bid on and won the items and a special thank you to our donors: Julia Kollar, Coni Ingram, Claudia & Michael Yakos, Tim Pearson, Parri Van Dyke, Andrea Stewart, David Hill Vineyard and Pacific University. RYLA Applications Being Accepted: Our club is looking for one more applicant to send to this year’s District 5100 RYLA, July 13-19 at Camp Meucha in the Columbia River Gorge. Designed for young professionals ages 18-29, the purpose of RYLA is to recognize young leaders and provide them with an opportunity to expand their perceptions and ideals. The application deadline is May 31. Participants are accepted in the order they are received, so timing is critical. If you know of a potential applicant, please have them contact Loren Waltz. More information on RYLA is available at ryladistrict5100.org. The annual celebration is considered by many to be one of Washington County’s signature events and is believed to be the largest student-run Lu’au on the West Coast. Festivities began with an authentic Lū’au meal featuring traditional staples kalua pig, chicken long rice, teriyaki chicken, poi, haupia, coconut cake and punch. A spectacular show, led and performed entirely by Pacific students, followed and included traditional Polynesian dances, music and other entertainment. Pacific’s Lū‘au, the primary fundraiser for NHOH activities and community service events, is a large collaborative effort of more than 300 student members, as well as their family members, university faculty and staff, and other local community members. NHOH was founded in 1959 by 16 students from the islands of Hawaiʻi under the guidance of Dr. Fred Scheller and Dr. A.C. “Hap” Hingston. The club’s membership grew rapidly, and by 1962, 60 members represented five of the eight islands of Hawaiʻi. Today, the student club is open to any student interested in learning more about the culture of Hawai‘i. NHOH members actively share their island traditions by performing at various functions both on and off the university campus. Students from Hawai‘i comprise about 14 percent of the undergraduate student body at Pacific. 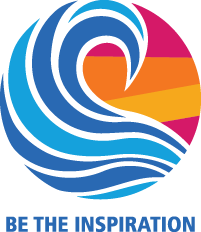 Pacific has a number of scholarships available for Hawai’i residents, and provides comprehensive support to students from Hawai’i and their families through its Office of Hawai’i Outreach and Programming. Our club received a sneak peek of the performance.